It’s finally time to start heading north, with only 1 1/2 months left to cruise The Bahamas. We’ve spent more time in Georgetown than we thought we would, but I must say we have a new appreciation for this area and thoroughly enjoyed our time here. 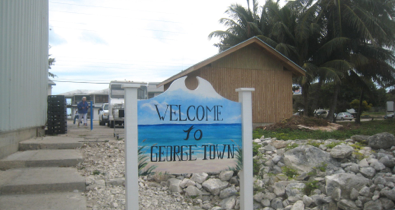 When staying in Georgetown you can do as much or as little as you want. You can anchor among the crowds, or find a quiet anchorage by yourself. On our last night here, a group is organizing sundowners on Queen’s Dock, a beach near us. We had already decided to go to one last dinner at the St. Francis. The food is comparable to any good restaurant and that is rare in The Exumas. We had a wonderful dinner with Cathie and Tom (Interlude), followed by a walk down to the beach on the Sound. 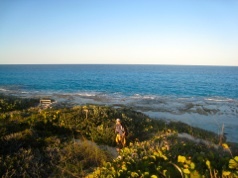 Beaches are abundant but I wish we had spent more time on the Exuma Sound side. The photo at the left was taken from a hill overlooking one of the anchorages in Elizabeth Harbor. The one at the right is another shot from the hill, looking out at the “holes” where people tie up to mooring balls. One of them is a hurricane hole and the boats on those balls are stored for the season with no one aboard. As I am writing this, a call came over the VHF saying, ‘Lady Muriel has entered the harbor.” I went out of the deck to see if she was some big megayacht, but instead saw a sloop being towed in. She is here for the big Bahamas Sailing Regatta which starts at the end of April and is one of the racing sloops that is a frequent winner. Representatives from every island in the Bahamas, except Bimini, are entered in several classes. The races take place in Elizabeth Harbor and I’m sure it is quite a spectacle. This regatta is over 50 years old. Unfortunately, for cruisers who have to be back in the States by the beginning of hurricane season on June 1, it happens too late in our season. We will leave tomorrow and sail to Lee Stocking Island with Interlude. It’s always nice to travel with another boat, especially when the cruisers are friends. Today a 60 ft sailboat named Destiny called on the radio requesting information about getting a tow back to Georgetown. 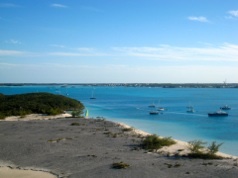 They were 16 miles north and 3 miles out in the Exuma Sound and had lost their engine. The wind was not conducive to sailing without power. They were advised to call “Elvis” who is the harbormaster of Georgetown and also runs a water taxi. He said it was too far for anyone from Georgetown to come but he knew someone near where Destiny was and also knew someone who could work on his engine if needed. That would certainly be a scary situation, but I suspect all is well now and the cruisers are safely ashore. On our way north we look forward to stopping at the cays we missed coming south when the weather wasn’t good for snorkeling and kayaking. We should be in Staniel Cay on Tuesday and will probably snorkel in Thunderball Grotto, made famous by the James Bond movie. We won’t stay there long, although we will pick up a package with our mail, a computer battery, and a 12V charger for the iPad. All of this will come in a box via Watermakers Air. 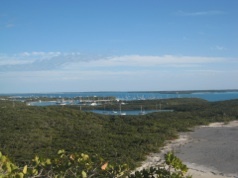 We will be going “outside” on the Exuma Sound for two short days and from then on will travel on the “inside” stopping at a number of small cays. The Sound side has ocean depths and the inside is shallow. Hopefully the sea will be as calm as it is in the photo at the left where Mark was climbing up from the beach. Tomorrow night we’ll be anchored in a very quiet bay. 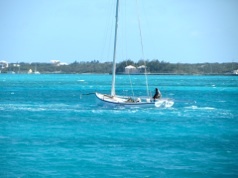 One of the characteristics of sailing in the Bahamas that so many cruisers like is your experiences are as varied as the thousands (3000) of cays, islands, and islets in this country.